Lencarguy, CadillacGM and RudyF6 like this. Totally agree. I hate it. The sideview highlights how the humpback roof rakes down all the way almost to the taillights, hardly any trunk shelf at all. I detest the rear quarter window that further accentuates that the roof line extends WAY too far towards the rear. "Looks like 2 different cars put together at the B pillar" you nailed it angel. Since I have developed the dreaded Torque Converter Shudder I am replacing my ATS. I was waiting for the finalized design to make a decision if the CT5 would be a contender. After seeing this design, hearing that the entire model lineup will be electric within 10 years, hearing that the naming convention is changing yet again and seeing Cadillacs total confusion in current and future plans.. I've decided they have lost my business. Lencarguy, CadillacGM, RedCadi and 1 others like this. looks like a fancy Charger to me. Maybe that is why they had the Charger camo? price at how I would like it optioned. Looks like a Honda Crosstour from a few years back. No thanks. That isn't true. It's my understanding that they'll start the new EV platforms with Cadillacs, not that all Cadillacs will be electric. They don't want to be a niche of a niche market any more than they already are. "Reuss said "one of the first" fully electric Cadillac models using the new platform would be on the market around 2022. He said it was too early to tell how long it would take for Cadillac's entire lineup to become electric, but he anticipated a combination of electrified and combustion engine models "for quite a few years" to come." Wouldn't that mean they'll have an electric version of there current lineup or do they plan on just being electric only? GM & Cadillac executives have publicly stated several times that the entire Cadillac model line will transition to all-electric over the coming years. They state that there will be a transitional period of about a decade where there will be a combination of electric and gas power before the entire Cadillac brand is all-electric. "GM CEO Mary Barra last year said the company is on a “path” to going all-electric, though she didn’t lay out a formal timeline. What is clear is that Cadillac will play a lead role, a move many analysts say makes sense because luxury buyers are less concerned about the higher cost of battery drivetrain technology. Cadillac’s electric SUV will be the first to use an all-new battery-drive architecture, but it won’t be alone for long, Carlisle said, promising a steady stream of battery-electric vehicles, or BEVs, will quickly follow. “It’s not unlike what we’re doing with (gas-powered products) now, with a new model coming every six months.” Initially, Caddy’s all-electric line-up will “overlap” its gas-powered line-up but those battery-electric vehicles, or BEVs, will begin to replace conventional models “in the middle of the 2020s and accelerate from that." The push into electrification will become a critical part of Caddy’s global growth strategy in the coming decade, Carlisle stressed, noting that China is already pushing for a rapid expansion of zero-emissions vehicles, while Europe and Japan are moving in the same direction. Those new models will serve as a “bridge,” he added, helping the automaker grow its presence beyond its two core markets, the U.S. and China. Cadillac’s bid to become a leader in electric propulsion faces some stiff competition from the likes of Audi, BMW and Mercedes-Benz, as well as Tesla, and could face a crowded market and skeptical buyers. It’s not the only place that Cadillac is pushing the ragged edge of technology, however." "could face a crowded market"
More likely a saturated market. A million or two EVs a year will quickly collapse the power grid and/or raise electricity prices so high no one not religiously Green will want one. I really hope they haven't bet the company on them. My first post here. I'd be considered a "conquest" customer. Never owned a Cadillac (always had respect for the V-series models) and currently own a Q7. This new model really intrigues me, it looks muscular and classy without going way overboard on fussy details (like the similar models from Infiniti, Lexus, and some extent the G70). I'm here now, and patiently will await further details as they come down the line. So basically I'm getting out of the X-over and into a sport sedan. This car has me very interested, the powertrain sounds promising, unless the interior is a total letdown It'll be a serious contender for my next vehicle. CadillacGM and SewellGM like this. Welcome. You're moving against the trend. 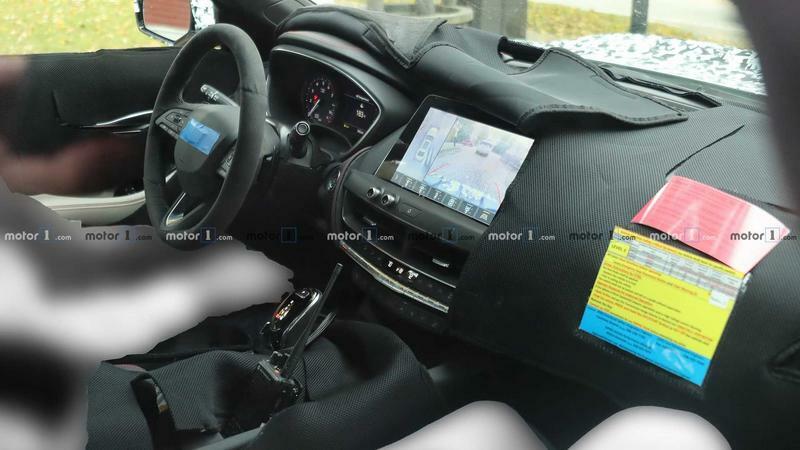 Here's a spy photo of the dash. I'm hoping there will be a non-black one, but likely not the first year or two. Reminds me of a Nissan Maxima (rear quarter window). Overall I think its a fine exterior but I worry that the interior will also be filled with cheap plastics and receive poor marks, alla the XT6. Also, Cadillac needs to stop it with the cheap silver badge on the side - its like they're not even trying. Has anyone seen the overall length specs? I'm interested to see how much "smaller" it is compared to the CTS? For all the talk about Cadillac "splitting the difference" in size between the ATS and CTS, this looks pretty much like a CTS replacement.